Heyo! Welcome to my website! Running is my main love, but I'm deeply passionate about so many other things as well. When I become interested in something I have a tendency of going all-in (holla to my ADHD peeps out there), and I love being able to be truly dedicated to a project, goal, or slightly-stupid but fun endeavor. Whether I'm speed-reading through a fascinating book series or fast packing the Grand Canyon rim-to-rim-to-rim I take the same dedication & passion I have for running and apply it to whatever I'm doing. Variety is the spice of life, and I love being able to find something new and exciting to pursue! A Wisonsin girl through and through, Molly attended University Lake School in Nashotah where she was a four-sport athlete (track, cross country, alpine skiing, and field hockey) and national standout. In addition to joining Suzy Favor as the only female to win four state individual titles (which she did in both the 1600m and 3200m), she was also a Gatorade Cross Country Runner of the Year, Foot Locker National Champion, and New Balance Nationals one-mile and two-mile All-American. From there, she attended Univeristy of Notre Dame where the winning continued. 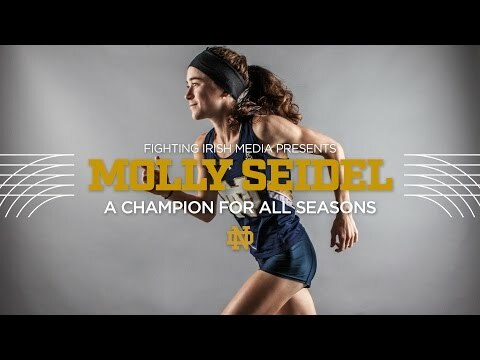 Not only did she secure multiple ACC Championships, but she would come away from the Fighting Irish as a decorated All-American and three-time NCAA Champion, once each in the 3k, 5k, and 10k. All this while earning a degree in Biological Anthropology, minoring in Environmental Science. "Music is one of my biggest stress-relievers; I play a number of fairly odd instruments including the piano, ukulele, 5-string banjo, and accordion. In high school I would play on the street in Madison for extra money, though now I mainly just play for my cat Mr. Banx." Molly's varied interests off the track don't just stop there, saying, "When I become interested in something I have a tendency of going all-in." As for where this may take here in sport, she says, "My main events are the 5k and 10k, though I absolutely love road & xc racing. I also developed a love of trail racing during a summer I spent doing Archaeology work in Argentina; one of my friends on my crew was an Argentinian ultra marathoner and encouraged me to enter a few ultra-trail events which were wickedly hard! In the future I'd really love to try out some of the longer trail events." "I spent the summer of 2017 fixing up a 1966 Airstream trailer and have a dream of someday opening a tea & coffee shop inside it. If that doesn't work out I'll probably just use it to go on adventures, if only I could find somewhere to park it in Boston!" In addition to adventures on the road, Molly would love to continue her adventure in the classroom as well, one day returning to graduate school, puruing a Master's or PhD in sports psychology.